Kumiko: I only need page 95. It is my destiny. Q: Is this film about japanese woman Takako Konishi? Beautiful and fantastical: She's driven like the blanketing white snow. Kumiko, finding a hidden VHS copy of Fargo (1996), leaves Tokyo to go to N. Dakota to find the film's buried treasure. Kumiko, the Treasure Hunter, is as fine a fantasy as you will find outside of the Disney Empire, and more insightful. Based upon an urban legend about a Japanese tourist who froze to death seeking the treasure, a bit of the Coen brothers' fabulous story lingers in this equally endearing tale. 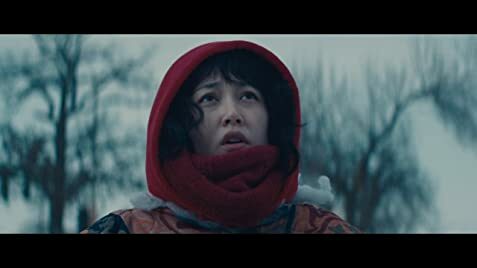 Kumiko's a lost 29 year-old soul looking for the end of the rainbow--a little like most of us with dreams or bucket lists just beyond our grasp—but we'll still dream of them or actually pursue the dream in the face of insurmountable odds. Kumiko at her job is distanced from her peers and an enigma to her boss, who lets her go with the company credit card because she is depressed, and he needs to fill her "office lady" spot with a younger model. As she's reminded along her journey, the film Fargo is just fiction, and the town not a pleasant time to be in winter. Yet, Kumiko persists with help from a kindly old lady (Shirley Venard), who would rather take her to The Mall of America, and deputy sheriff (director Zellner), whose motives are pure as the driven snow that covers the land. That snow gradually overcomes every scene with purity and menace, a blank slate upon which her dream can come true and nature, human and otherwise, can send her to oblivion if it wishes. 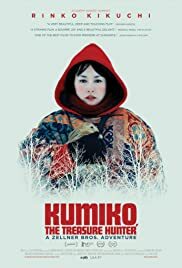 Looking a little like Red Riding Hood, she's the opposite of realists, who see Kumiko's folly yet cannot stop her drive to get to Fargo and the buried loot. The film is a Seinfeld variant because nothing happens except the most profoundly simple occurrences strengthening Kumiko's resolve and making us believers in her Quixote-like quest. For the lost Tokyo soul with only a pet bunny rabbit as Panza-like friend, Kumiko seeks to fulfill her fantasy, the naysayers be damned. (She likens herself to a Spanish Conquistador.) She hurts no one, and when at last she smiles, you know her quest is valuable only to her, a symbol of her achieving something in life to set her apart from boring normalcy. This film works as allegory, applying to all who should hold on to their dreams if only for themselves. Otherwise, it's a delightful tale acted perfectly, a treat to please our fancy and remind us about private dreams that keep us going.